From left, the party for dinner aboard the Pacific Princess included Joe and Betty Marchese, (the author) Renee, Danielle, and Eric Sklarew, Chris and Jasmine Marchese, and Allison Sklarew. It’s more popular than ever for extended families to travel together, and a cruise vacation accommodates clans of all ages and interests. Travel agents can be helpful, but if you want to plan a family cruise on your own, here’s some coaching from a very experienced multigenerational cruise family. Steer away from ships with more than 3,000 passengers. These ships often have lines at the buffet and a long wait to board tenders (these are ancillary boats that take passengers from ship to port). Smaller ships can dock in narrow, less-visited ports. Food quality may vary and some ships host better shows; but overall, the distinguishing factor is the number of passengers. Here bigger is not necessarily better, although cruising on smaller vessels is usually more expensive. We select a cruise based on the itinerary, rather than ship or cruise line. This is because we like to race around to as many destinations as possible. My family takes the leisure out of travel. However, there are cruisers who rarely get off the ship, as there’s plenty to do onboard these floating all-inclusive resorts. We also look for a minimal number of days at sea, to focus on visiting interesting ports. Having a balcony is a worthy splurge if you’re going someplace warm. If it’s cold or windy, you will rarely use it. Cabins with obstructed windows are claustrophobic; it’s better to have a window you can actually see through. Inside cabins are perfectly comfortable for kids, and prevent daredevils from trying to scale the balcony railing. Consider booking one large cabin, so you can get the group together for pre-dinner cocktails. Consider upscale ships when they offer 2-for-1 packages. Sure the sticker price may be higher, but it includes extras that you pay for on a budget cruise, such as transfers, excursions, or alcohol. Luxury ships feature exquisite dining, and their staterooms are quite spacious. (No dreaded sink-toilet combinations here.) Regardless of price, nearly every ship has hardworking, upbeat crews, 24-hour room service, and plush suites. This is supposed to be fun, you’re thinking, but removing kids from their routines, electronics, and friends can sometimes lead to misery. When traveling with children under 10, choose a ship with an active kids’ program. Good programs boast a well-equipped playroom, daily treasure hunts, kid-friendly meals, and a dedicated teen club. A Disney Cruise is wonderful for young families, but isn’t ideal with older cruisers in the mix. As for traveling with teens, they may be grumpy no matter what you do. You might consider pacifying them with an Internet package (around $50 for 120 minutes). You can sign up for the ship’s excursions — or you could find an alternative excursion online. You’ll find independent operators offering a wide variety of activities — group, private, culinary, adventure, shopping, sightseeing — and they may charge less money and provide more flexibility. These tours are typically less crowded, and are equally good, if not better, because you meet people who live and work in the locale. For example, our private guide in Roatan, Honduras, took us to ride horses on the beach, play with monkeys, and meet artisans crafting cameo jewelry. It’s rather dull to get off the ship and walk around the port. The ports are mostly cheesy places with tacky food and overpriced souvenir stores. There are a few exceptions, but still, you can’t experience a destination unless you explore the place beyond the port. So do your homework in advance, and avoid getting off the ship with no plans in place. Ask cabs to shuttle your group and specify a pickup time. Return to the ship with ample time to board before its departure. Worry over missing the boat is stressful, especially to seniors. 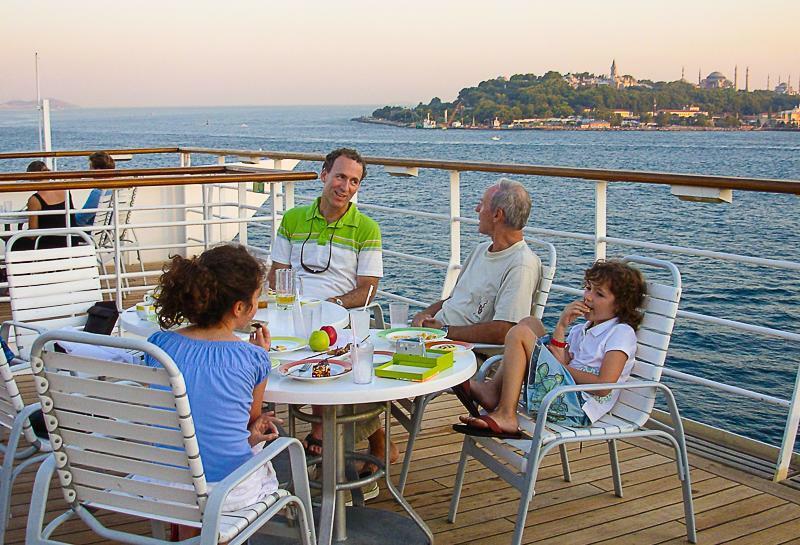 The best thing about cruising for extended families is how well ships accommodate groups. Whenever possible, they arrange for adjacent cabins, and they’ll set up tables so your family can eat together each night. In the dining room, the ship’s waitstaff genuinely tries to learn your names and personal preferences. They’ll gladly bring kids (and adults) burgers or pizza when they don’t like what’s on the menu. Don’t forget to tip them. Afternoon snacks after a tour of Istanbul. How long can we stand each other? I like going for a minimum of a week. On a shorter trip, you’re just getting your groove on, and then you’re thinking about leaving. Time goes by very, very fast on a ship, and days at sea are filled with fun activities, pampering spas, educational lectures, and workouts in gyms with floor-to-ceiling views of the ocean. Sometimes it’s nice just to hang out and read. With so many activities, everyone can do what they want. For us, the best part of cruising is staying put — same room and same bed every night — while visiting new places. You may sleep better, too, thanks to the gentle rocking of the ship motoring overnight. I’ve never been seasick though I get carsick easily. Even in rough seas, cruise ships maintain their balance. If you’re worried, ask for a Transderm Scop patch from your doctor, wear acupressure bands on your wrists, or nibble candied ginger. They all work well. OK, you’re ready to book your cruise. Bon voyage! Renee Sklarew can be reached at reneesklarew@msn.com.